Pandan leaves are often used in Thai, Indonesian and Malaysian cooking. I particularly love the green colour as well as its refreshing and pleasant fragrance. Coconut milk (coconut cream) is a perfect partner with pandan in making desserts. 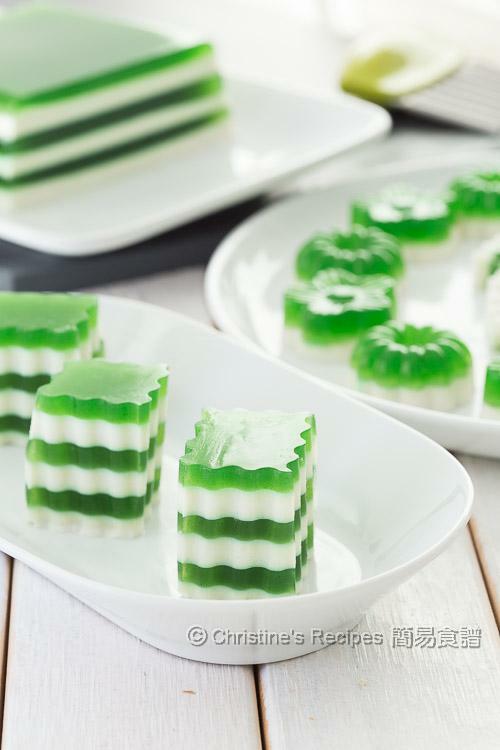 Beating the scorching heat in these few days down under here, I made this delicious cold dessert, pandan-coconut layered agar jelly. Agar (also known as agar agar) is a gelatinous substance, extracted from algae, an edible seaweed. It produces a firmer texture than gelatine and can set very quickly at room temperature. 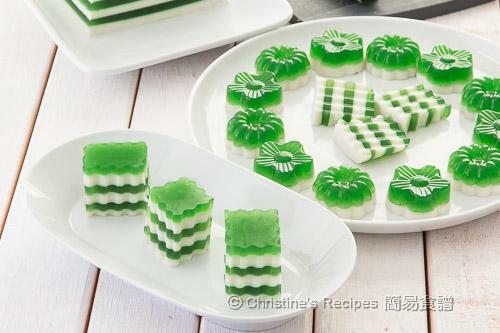 This jelly is very smooth, not too sweet, with a subtle mix of pandan and coconut fragrance. It’s absolutely refreshing in such a hot weather. Transfer the 100ml of pandan juice into a pot. Add in 500 ml of water, sugar and agar powder. Stir to combine. Cook over medium heat and bring it to boil, until the sugar is dissolved. (Pandan paste can be added at this stage if desired.) Strain through a sieve into a measuring cup or bowl, sitting in another bowl of hot water to keep warm as it sets very quickly once it cools down. In another pot, put coconut cream, milk, sugar, salt and agar powder. Combine thoroughly. Cook over medium heat until it almost boils and the sugar is completely dissolved. Place the mixture into a measuring cup or a bowl, sitting in another bowl of hot water to keep warm as it sets very quickly once it cools down. Spoon the pandan mixture into the jelly moulds up to half way. Wait until the surface sets. Spoon the coconut mixture to fill up another half. If you want more layers, the method is about the same. I used a rectangular glass container. Spoon 1/3 of the remaining pandan mixture into it. After its surface sets, spoon 1/3 of the remaining coconut mixture on top. Repeat this step to make layers alternatively. Cover and refrigerate it for about 3 hours. Remove from the moulds. Enjoy! Before adding a new layer of any mixture, make sure the previous one sets properly. Otherwise both colours will be mixed together due to the stream of mixture pouring in. You can make as many layers as you like. The more layers you want to make, the more challenging it will be. It should be well fit into your own moulds or containers. 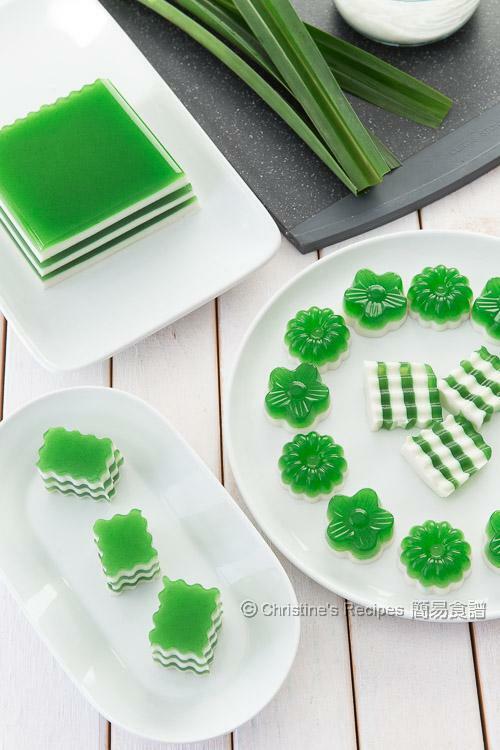 By adding the pandan paste, the green colour will be brighter. It’s optional though. You're amazing, Christine! Your recipes are so inspiring, thank you for sharing. I will definitely have to try this one. Thank you. Happy cooking ! It looks so nice. I want some of those. Last time I ever tried to mix up some jelly it ended bad. Yours look so nice. Hope you'll be successful this time. So gorgeous! I wish I could find pandan over here. in the first ingredients you said 150ml of water,but then you never mention the 50ml anymore,where were they go? 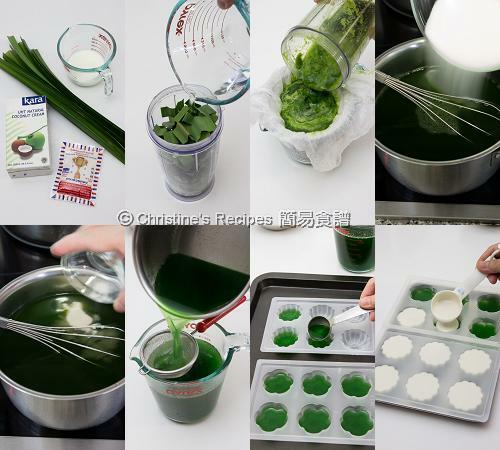 The 150ml of water is to blend with the pandan leaves. 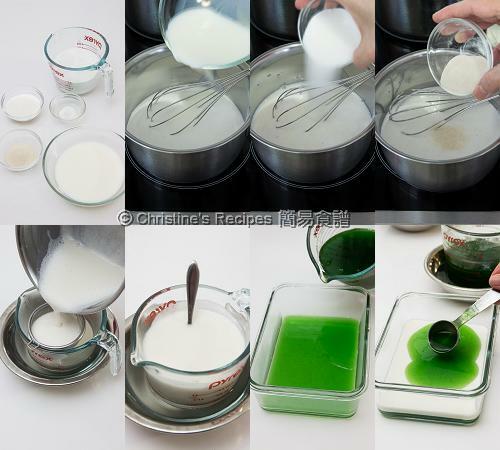 Then you'll get some mashed pandan mixture, then squeeze the juice from mixture and measure out 100ml of it to make this dessert. Is possible if I don't add milk? If yes, what is the potion for coconut cream? can i substitute pandan juice with pandan essence. You only need a few drops of pandan essence and will get enough colour. So the 100ml of pandan juice has to be replaced with water. Dear Christine. Why the coconut and the pandan layer get separate. Won't stick together? sorry, no idea. I've never come across this problem. Just a guess. Could it be the surface was wet? So the layers won't stick together. Hi Christine, I have just discovered your blog and I can't wait to start on some recipes! What could you suggest for a substitute to agar agar? Would gelatine be just as good? Thank you in advance! Gelatine will do and produce different texture. Feel free to experiment. Let me know how you go if you try. I got pandan leaves from Yuen's at Market Square. They sometimes have fresh ones. If they don't, you can get some frozen ones in freezer. I live in area where pandan leaves are not commonly sold. How much pandan essence should I use to substitute the leaves and water? If you have used pandan essence before, you would know its green colour is quite dark. Just a few drops are enough. I used both milk and coconut milk for making this dessert.